The former Philpott family home on Victory Road in Derby is being cleared, ahead of it being demolished. Its former tenants, Mick and Mairead Philpott, were jailed for the manslaughter of their six children in a fire there, last year. Derby City Council is today clearing out the former home of the Philpott family. Dwayne, Jade, John, Jack, Jesse and Jayden died from smoke inhalation after a blaze at the property on Victory Road in Allenton in the early hours of May 11th 2012. The father of the children, Mick Philpott, their mother Mairead and Paul Moseley were all jailed for their manslaughter. The house will eventually be demolished. Derbyshire Police refuse to comment on reports that Mairead Philpott will appeal her 17 year sentence for the deaths of her six children in a house fire in Derby. Mick and Mairead Philpott, the parents of the children, were jailed last month for manslaughter, along with friend Paul Mosley. Jade Philpott, 10, and brothers John, nine, Jack, seven, Jesse, six, and Jayden, five, died on the morning of the fire and Duwayne, 13, died three days later in hospital. Lanterns were lit in Derby on Sunday in remembrance of the six Philpott children who were killed in a house fire started by their father. Jade, 10, and her brothers John, nine, Jack, eight, Jesse, six, Jayden, five, and Duwayne, 13, died last May. On Sunday, Derby City Council confirmed its intention to knock down the property and the adjoining semi. Mick Philpott, 56, was jailed for life last Wednesday after being convicted of killing the children. His wife Mairead, and their friend Paul Mosley, have been sentenced to 17 years. Cllr Baggy Shanker, councillor for Sinfin and Osmaston, has told ITV News Central that it is the council's intention to demolish number 18 Victory Road, where the six Philpott children died in a house fire last year. However, the council needs to buy the adjoining house, number 20, from the estate of the previous tenants, who have died. A consultation will then begin with local residents about how to use the site. A minute's silence has been held at Derby County's match against Ipswich, in memory of the six children who died in a house fire in the city last year. 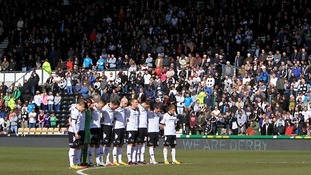 Moments before Derby County kicked off at Pride Park Stadium this afternoon, thousands of fans paid tribute to Jayden, Jesse, Jack, John, Jade and Duwayne, who died when their father, Mick Philpott, set a fire that took their lives. Angela Mosley – the sister of a man who assisted Mick Philpott with a fire that killed his six children, spoke to ITV News Central at a Derby County match where a minute's silence was held for the children who died in the fire. Paul Mosley was sentenced to 17 years in prison for six counts of manslaughter. He will have to serve at least half of his time. Angela says it's hard to put into words how she feels. A minute's silence has been held in memory of the six Philpott children who were killed in a house fire started by their father. Supporters, staff and players fell silent at 3pm to remember Jade, 10, and her brothers John, nine, Jack, eight, Jesse, six, Jayden, five, and Duwayne, 13. An online petition has been set up, calling for the Philpott family home on Victory Road in Derby to be demolished. The tenants, Mick and Mairead Philpott, were this week jailed for the manslaughter of their six children in a fire last year. Mick Philpott was sentenced to life in prison, serving at least 15 years, and Mairead Philpott was sentenced to 17 years. She will serve at least half the sentence. Duwayne, Jade, John, Jack, Jesse and Jayden Philpott. A minute's silence will be held today in memory of the six Philpott children who were killed in a house fire started by their father. Derby County Football Club has asked supporters to join staff and players in remembering Jade, 10, and her brothers John, nine, Jack, eight, Jesse, six, Jayden, five, and Duwayne, 13. A spokesperson for the club said the Rams will hold the minute's silence ahead of their fixture with Ipswich Town at Pride Park Stadium this afternoon. Mick Philpott, 56, was jailed for life on Wednesday after being convicted of killing the children along with his wife Mairead, 32, and friend Paul Mosley. Following Derbyshire Fire Service's recommendations over having sprinklers in homes, here are the best ways to improve fire safety at home. Speaking exclusively to ITV News, Dawn Bestwick said jail wasn't good enough for MIck Philpott and that "as a coward" he "deserved to die".